Robotae has completed the development of a motion control library capable of driving up to 32 stepper motors from a single STM32 microcontroller. The library generates motion profiles in velocity or position mode and outputs step/direction signals for stepper motor driver chips. The microcontroller’s timer units are used to their full potential, ensuring the timing of the signals are accurate to a single clock cycle, giving smooth motion. 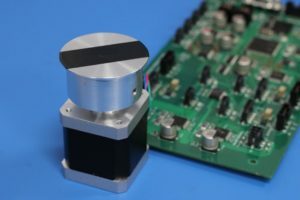 The library’s first application was on a PCB designed by Sartorius Stedim Biotech Group (formerly TAP Biosystems), running seven motors and a range of other actuators and sensors using a single microcontroller.